2016 wasn’t a great year of running for me, I was injured almost the whole year with repeated calf strains and Achilles tendonitis – I blame it on wearing a pair of spikes for a 3200m time trial in April that I hadn’t worn since university. After that I continued running in trainers that were too light and not supportive enough for me, thinking that shaving a few grams off my shoes would make all the difference. Lesson for us all – choose your trainers carefully. Whilst I wasn’t running, I had a bit more time to look at some future races – trying to give myself something to look forward to. 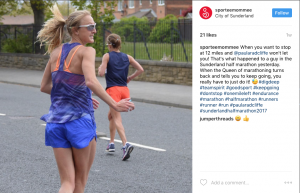 I already had an entry for the Great North Run (GNR) in September and fancied trying another half marathon and the Sunderland half marathon popped up – I thought why not? Their advertising slogan was ‘#Paula made me do it’ and Paula Radcliffe was making a guest appearance. I booked the race but it was several months in advance so I pretty much forgot about it. 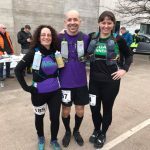 In January 2017, I had some orthotics made to try and help with my injuries and started some very gentle running – 49 miles in January, 68 miles in February – prior to this, I’d had trouble walking never mind running. 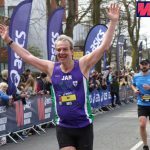 I got more miles done in March and then increased intensity a little during April – before I knew it, the race was coming up in a couple of weeks and I was actually feeling quite good – may even sneak a few seconds off my PB. So…race day. 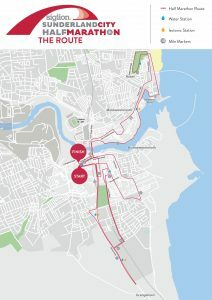 The race was due to start in Sunderland Keel Square at 10.25. I got up about 7am as I like to leave at least 3 hours after eating before I race (not so fussed for a training run), although I never seem to feel hungry on race day – I get excited like a child at Christmas. Louise and the kids were coming to watch so we set off about 9am and managed to park In Sunderland easy enough. Louise and the kids walked to the National Glass Centre where the race passes at about 9 and 12 miles and I jogged to the start. Runners could leave their bags in a car park, so I dropped mine off and went for a jog through the streets. The day was also hosting a 3km kids race and a 10k race. I arrived at the start area where the 10k racers were all lined up and Paula Radcliffe and Aly Dixon were being interviewed over the tannoy. The 10k race set off and the start area was open for the half marathon – what struck me immediately was how much more personal this felt than the GNR. I was actually quite near the start line and had a brief chat with Steven Jackson before we lined up. Well, the gun went bang and we were off – I was hoping to run at a pace of about 6 min 35 secs/mile. Mindful of Alan’s mantra – ‘don’t go off too fast’. At the start of any race, it must be the adrenaline, because the running feels effortless – you can run at what feels an easy pace that you just can’t do in training. Mile 1 was a little loop through the city centre streets. 6 min 24 secs – slow down! Mile 2 was a larger loop through the city streets – 6 min 26 secs – SLOW DOWN! The thing was, I had people of all ages and shapes and sizes still shooting past me. Mile 3 – still looping through the city streets, crowd support was great with lots of people clapping and cheering. There was a water station with some squeeze sachets but no matter how I tried I couldn’t get a drop out of it, I just had to chuck it. I had to work a little here but completed the mile in 6 min 32 secs, ok better, try and keep this pace. Mile’s 4 and 5 – the course is starting to open up a little now with longer straights, slightly undulating and bit windy. The course keeps switching back on itself so you’ve either got a headwind or a tailwind. Always more aware of the headwind! 6min 21 secs and 6 min 27 secs – still faster than planned but feeling ok. So.. it’s around here that things changed. The generic clapping started being drowned out by the crowds getting really excited. 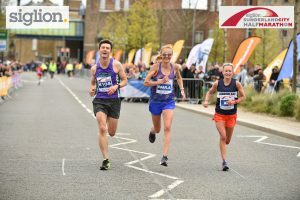 I could hear it quite a way back at first and then somewhere between 5 and 6 miles Paula Radcliffe (PR) and Aly Dixon (AD) jaunted up by my side looking fresh as can be – they weren’t racing at all, I would like to point out. Just at this point, I’d been having a bit more success extracting my isotonic drink from its carton than I had the water, but in my excitement sloshed most of it over my right arm – really sticky. I blurted out ‘what an honour!’ – just couldn’t think of anything else! And then I just thought, scrap my race plan, just try and hang on to these two for a family photo. I said – ‘I hope you don’t mind, I think I’ll try and hang on until 9 miles – my family’s there’. PR replied – ‘We’ll see if we can keep us with you’ (very polite!). Miles 6, 7, 8 whizzed by – I must have appeared as a random runner in many hundreds of photos, loads of spectators were trying to get a photo of the celebrities. I was feeling really good, I’d certainly stopped looking at my watch. PR and AD were messing around using me as a windbreaker when we had a headwind. AD was giving PR a tour of the sights – well, what sights there are. ( I can say that having been born in Sunderland). More turns through the city centre and back through Keel Square where the crowds were impressive. We crossed Wearmouth bridge and AD and PR were asking where my family were and what they were called. Well at this point I wasn’t gasping too much, so replied ‘They should be just outside the Glass Centre at the riverside, my wife Louise, daughter Ava and son Jude’. Mile 9 – Mission accomplished, I’d reached my target. 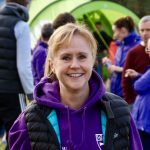 Louise recalls seeing the runners come her way, wow, Paula Radcliffe and there’s Aly Dixon too, and, who’s that?..Mark! It’s getting harder to impress the kids these days but I think this one worked. Mile 10 – Although I’d only planned to try and keep up to this point, I was having way too much fun to drop off. This mile was quite flat, right next to the River Wear, the route wiggled through the marina where there were some sharp turns. On one of these turns PR bumped right into me, she quipped ‘sorry, never have been able to corner’ before making some jokes about Aly’s lower centre of gravity and cornering skills. I was still feeling great, until we opened onto the sea front, then BLAST, there was this huge headwind. I must have dropped back straight away as PR said ‘are you struggling?’, I mumbled ‘just a little’, suddenly feeling like I was struggling a lot. She said, ‘tuck in behind me, I won’t be much of a windbreaker but I’ll be better than Aly’. I graciously took the opportunity and followed her step for step. Soon we turned into Roker Park and out of the wind. This had its own tests with some sharp turns and steep park paths – again very well spectated here. But another mile down. 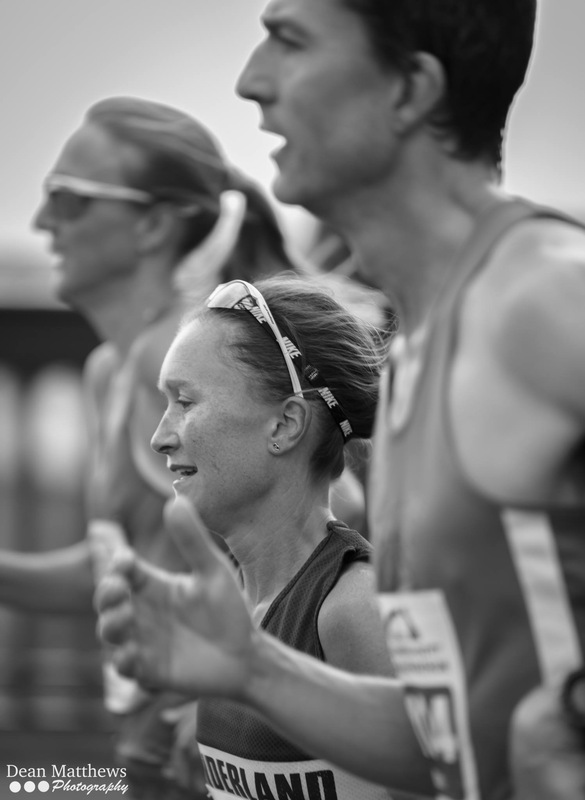 Mile 11 – Now if you’ve paced well, you should be in for an easy run home. From here you’re on the road, wind behind you and heading to the finish. I had not paced well, yet was loving every stride, and now had the aim of a family photo opportunity at mile 12. 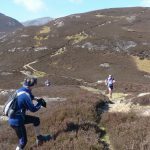 I was digging deep here, my feet were burning, my breathing was really laboured, my heart felt like it was jumping out my chest and I could feel my running form turning to rubber. PR and AD could see I was struggling yet they were both really encouraging me to hang on. PR was passing me water from the fuelling station – still couldn’t get a drop out! As mile 12 was approaching, I was working so hard yet falling back inch by inch and then before I knew it there was a few meters between us. Throughout the whole route there were 2 men on bikes with yellow ‘event crew’ jackets. As I dropped off the pace, PR shouted to one of them to drop back with me and help me. He did, and I don’t know how he did it, but by following his bike and his calm words I was back in line – just in time for passing the family. PR whooped ‘Come on give him a cheer’ as I ran past. This gave me a real rush of adrenaline and suddenly I felt great…for all of 5 seconds. Mile 12 – I had exceeded my physical capacity by now and despite more encouragement from both PR and AD, I dropped off, unable to offer a word of thanks. I just thought, wow what a run. I looked at my watch for the first time in 6 miles and realised even if I walked the last mile, I had a PB. 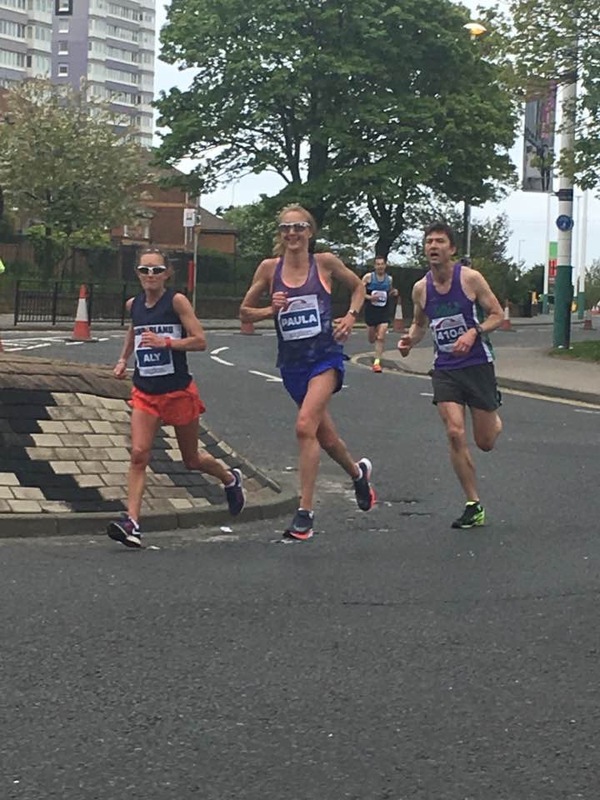 I settled into a comfortable pace and just enjoyed the last stretch – last road and over the Wearmouth bridge with a sign that said 400m to go. A few runners went past me but I really didn’t care – talk about ‘runner’s high’. Mile 13/finish – I turn right after Wearmouth Bridge and could see the finish line ahead. Hang on – who’s running towards me? 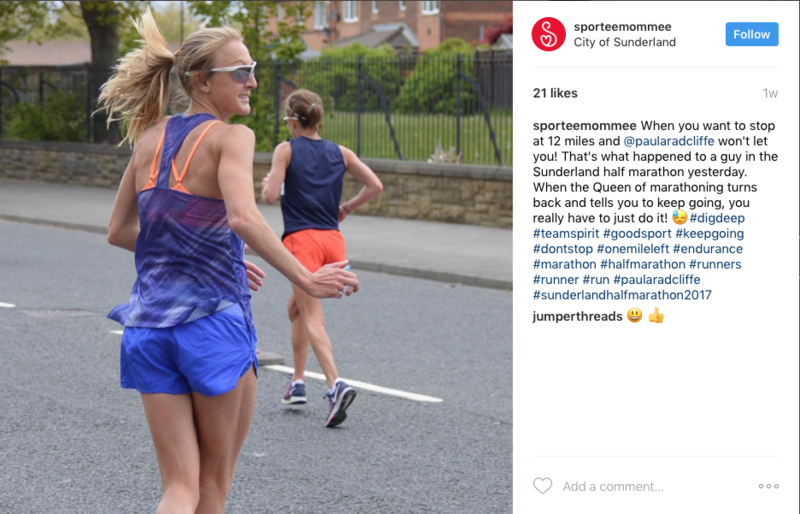 Paula Radcliffe and Aly Dixon – absolute dream! ‘Come on!’, ‘Sprint finish!’ they’re shouting as they turn around and run with me to the line. I’m feeling like I could run the course again now! I cross the line – before I now it I’m getting a hug from Paula and then a hug from Aly (I’m thinking I’ll never wash again!). I got my chance to thank them and said how unforgettable it had been. Aly said did you get a PB? I replied – yes, by nearly 5 minutes! Average pace 6mins 22secs! I walked away – just couldn’t’ believe it! Got some water, got my medal, got my T-shirt and goody bag and couldn’t wait to tell anyone I could what had happened – so here it is! I’m writing this nearly 1 week later and still haven’t stopped smiling. Running – good for the body, mind and soul! My only concern is – how do I top this?! Postscript: It isn’t every day we add quotes from Olympians, but our Chairman bumped into Aly at the recent Pier to Pier race, and we’re very grateful for what followed! Click here for Elvet Striders results.